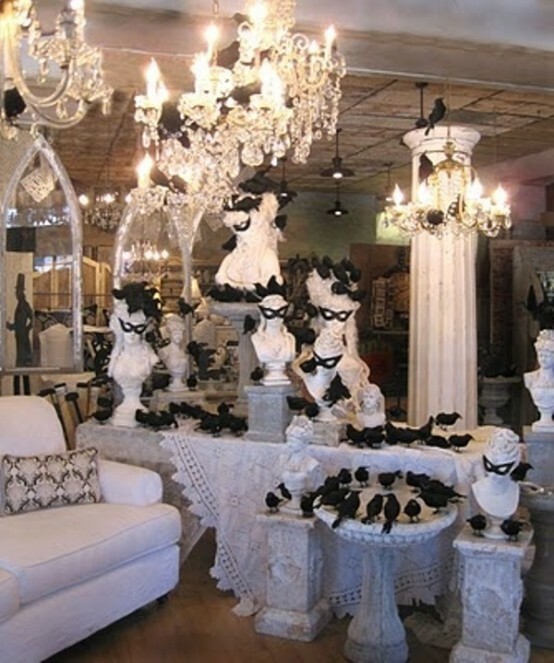 Black and white is a classical color scheme that is always popular and fashionable. 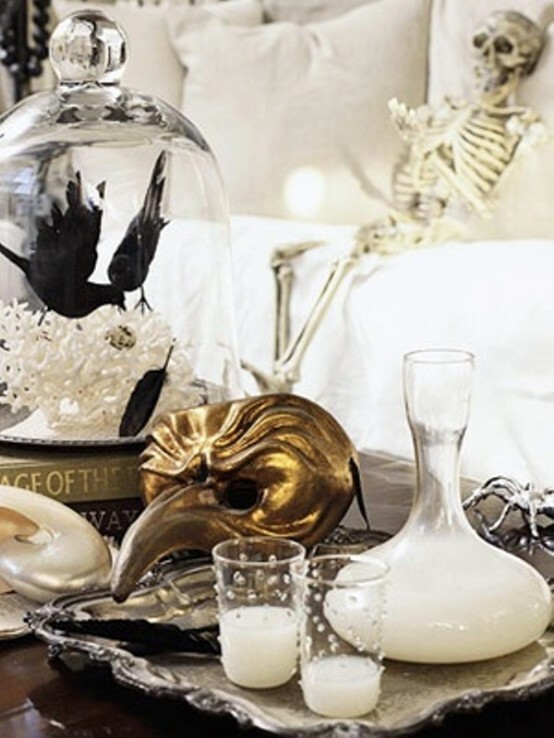 Choosing this scheme for Halloween party is a brilliant idea as it’s very elegant, stylish and suits even for the most formal party like a party with your colleagues. 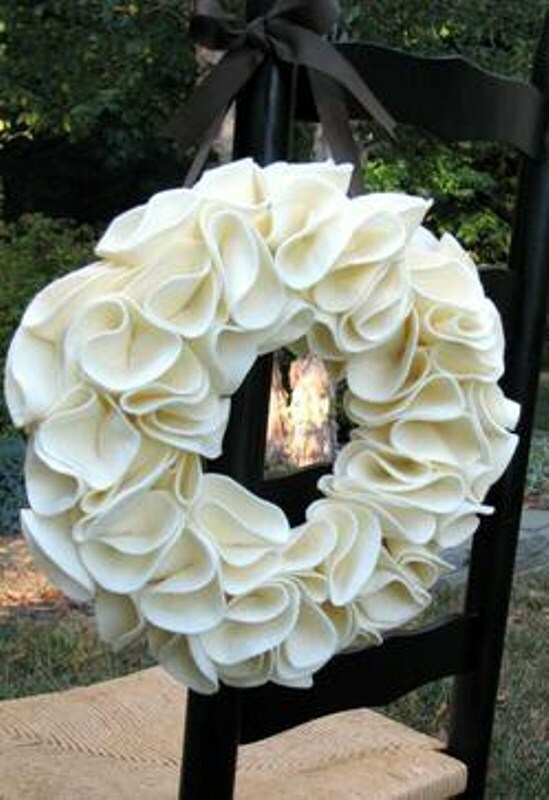 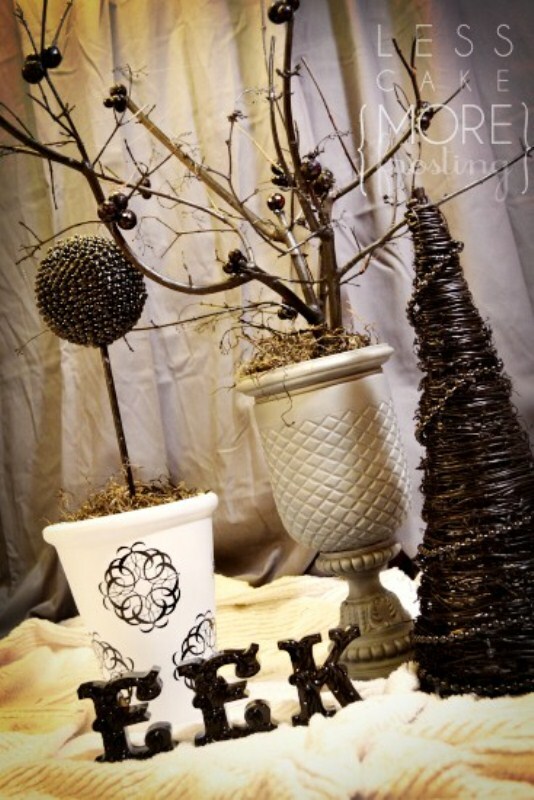 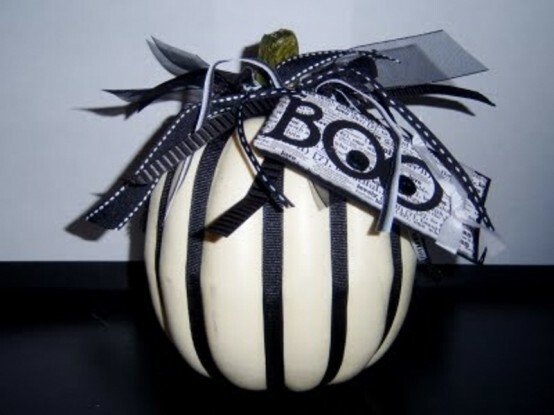 You can buy some faux black and white pumpkins, make some black garlands or wreaths. 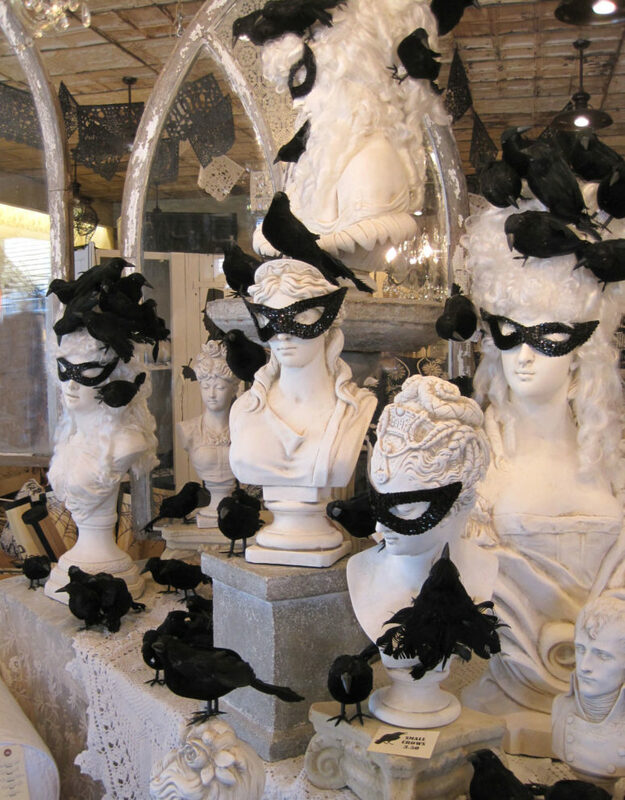 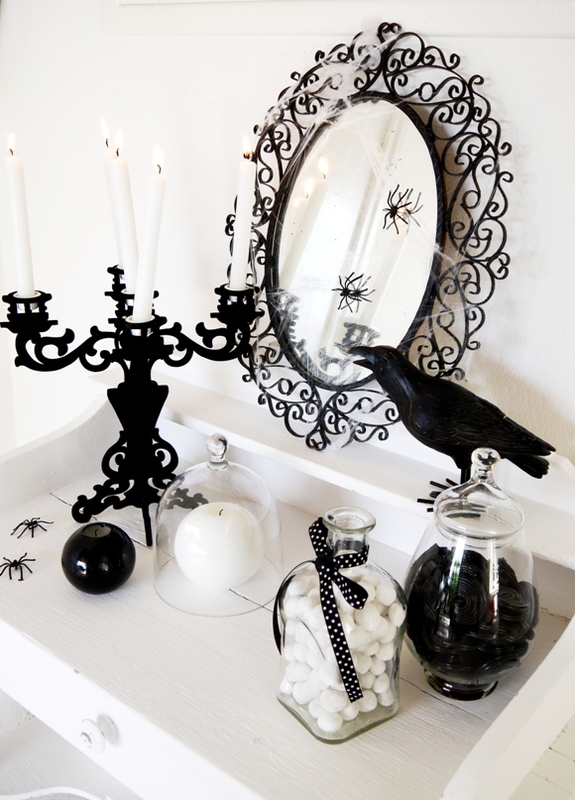 An interesting idea is a white room decorated with black ravens and spiders, add some skulls and it’s a success. 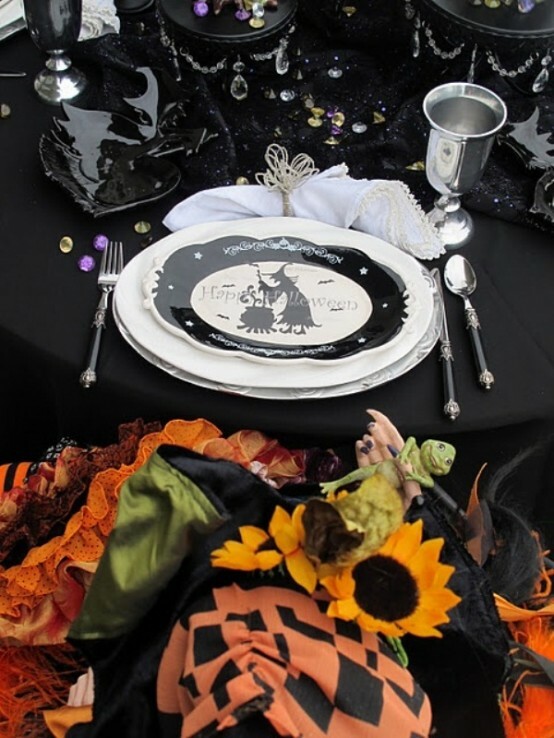 Black and white tableware and tablecloths look exquisite, put some faux scary human body parts and stylish black and white treats – and your cool table is ready. 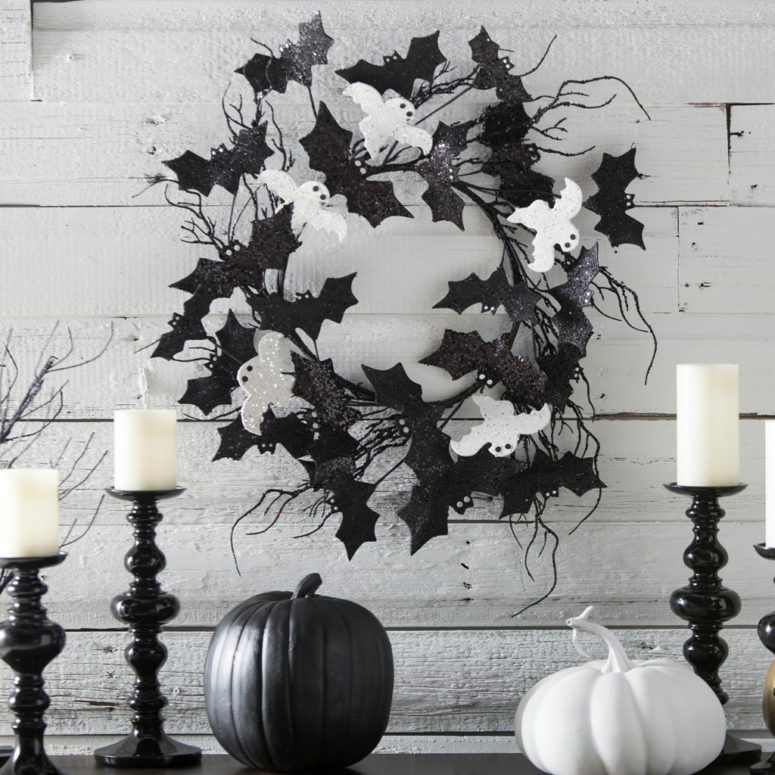 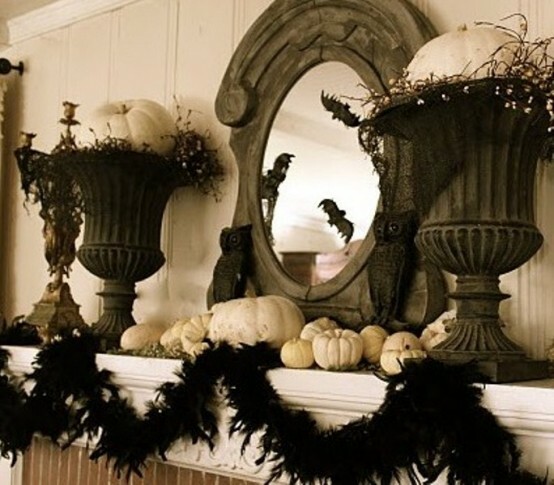 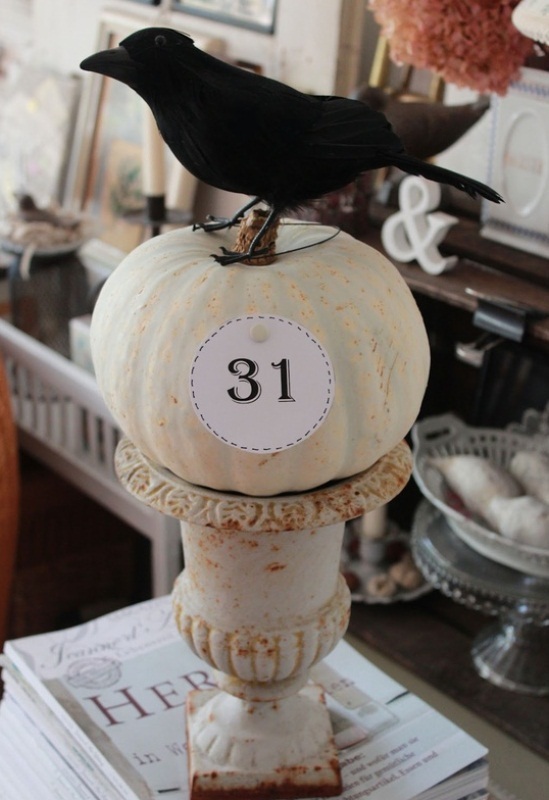 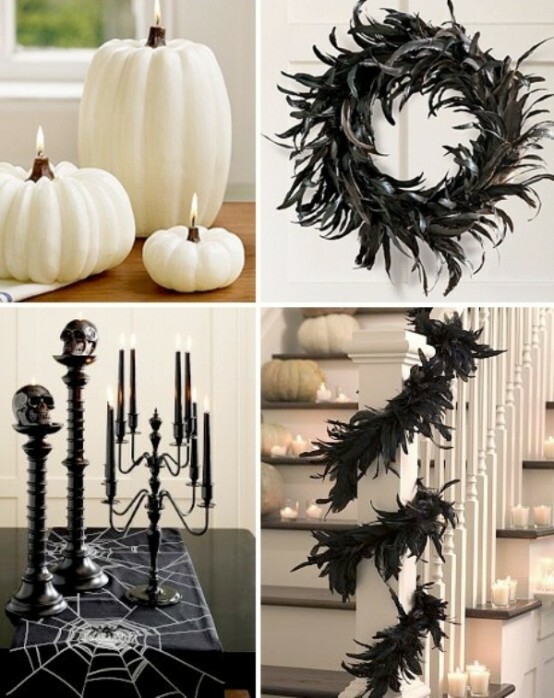 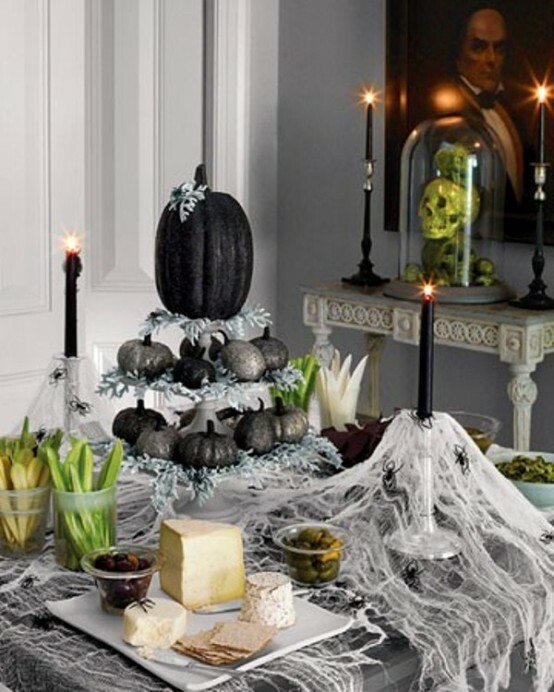 Put black lace on a white pumpkin, white or black wreaths, white candles in black candelabra, and faux web. 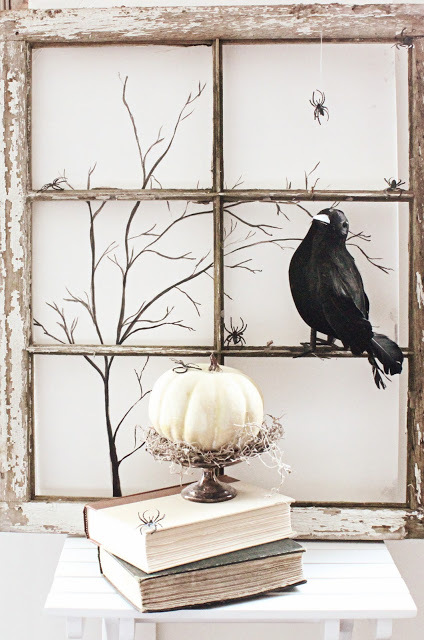 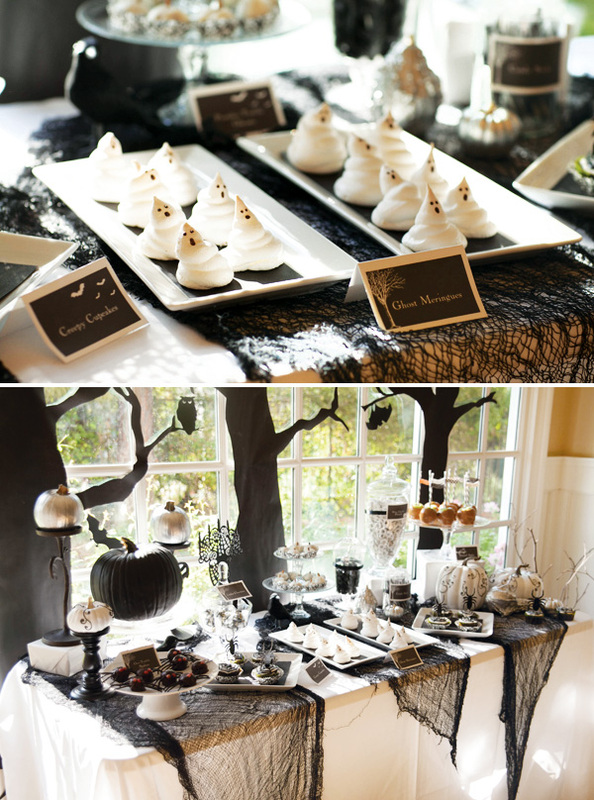 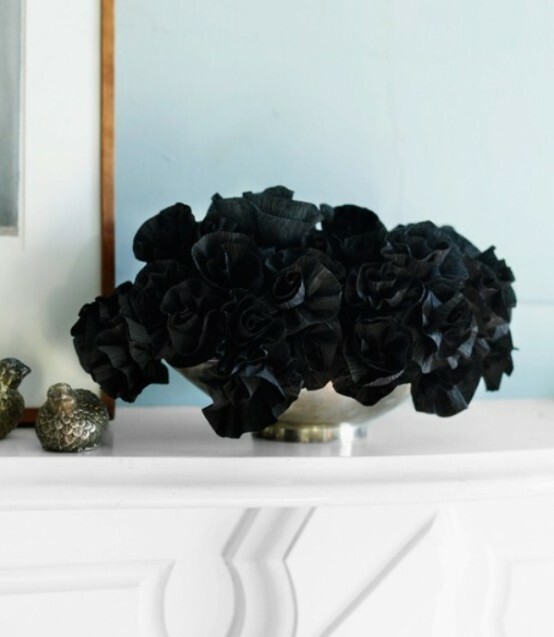 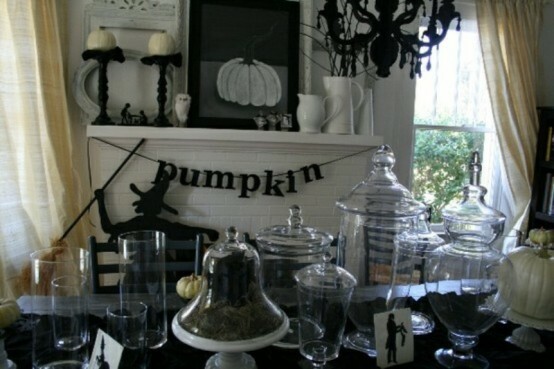 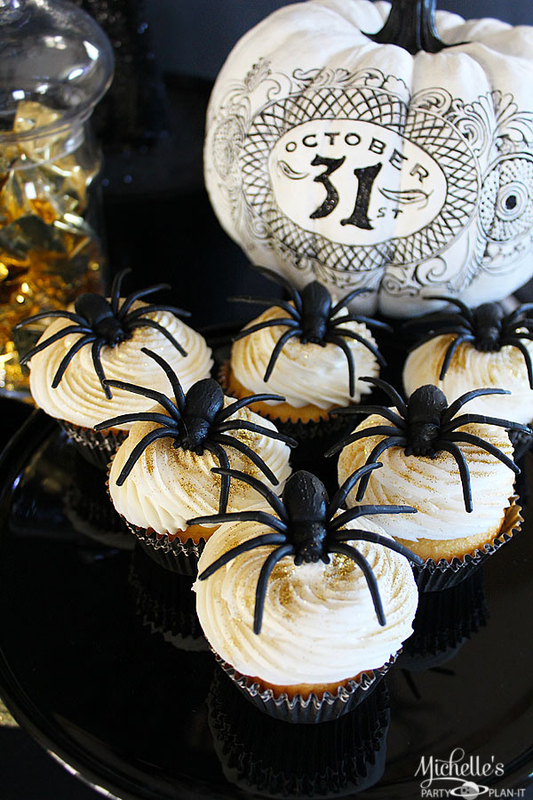 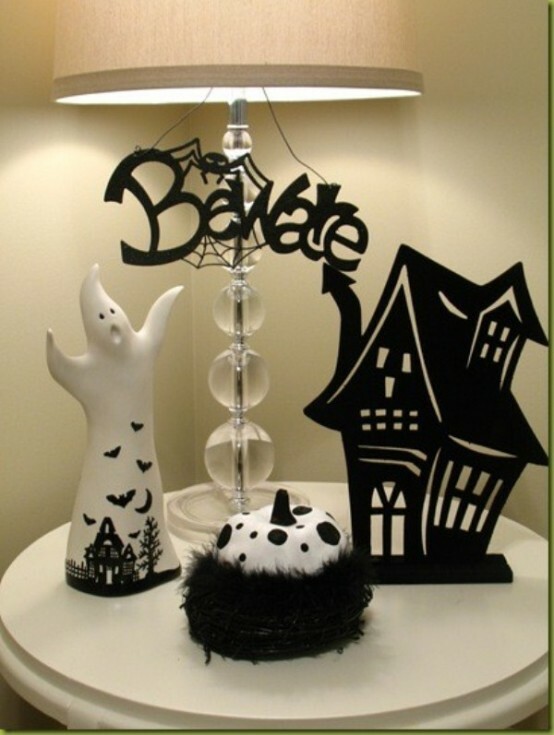 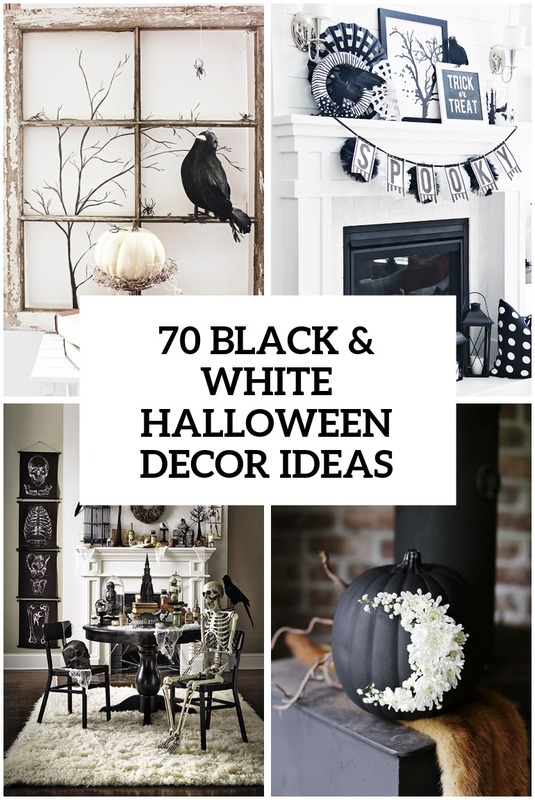 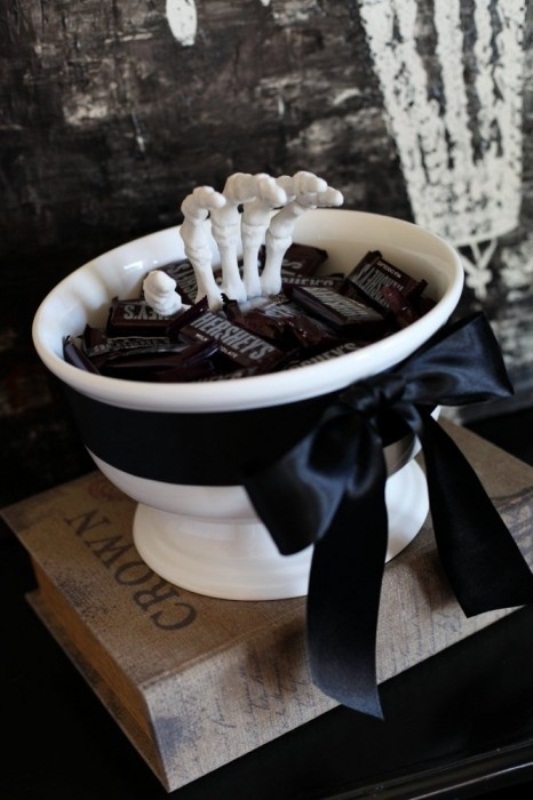 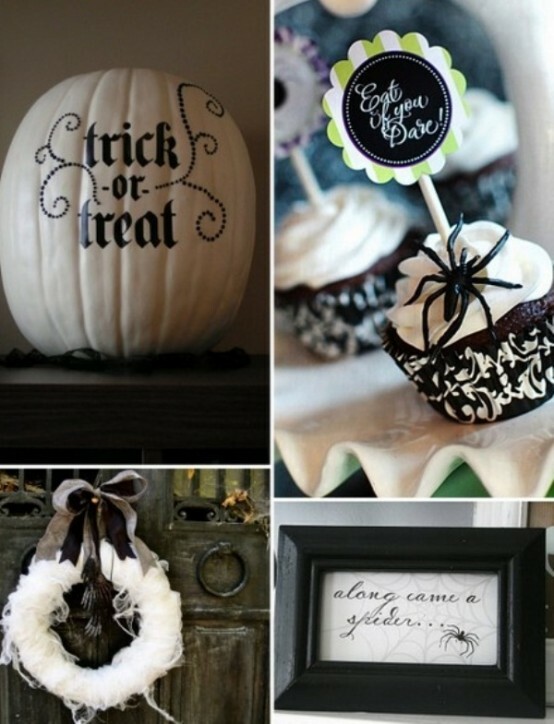 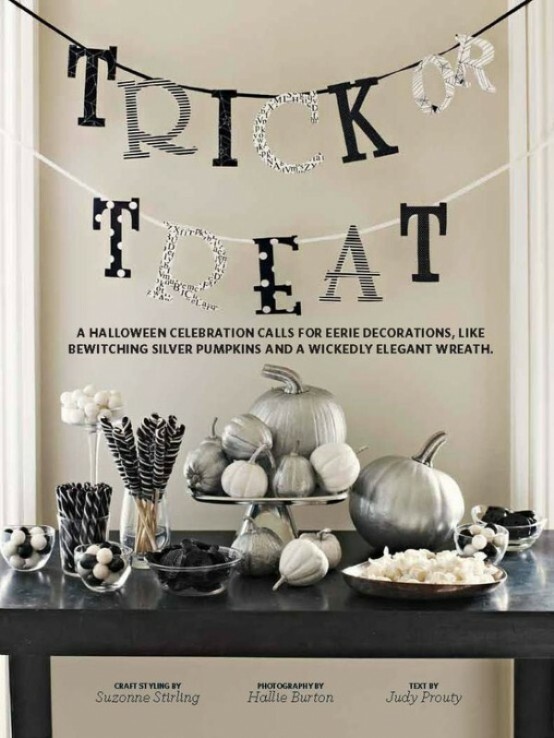 Below you’ll see some more ideas for stylish black and white Halloween party, get inspired! 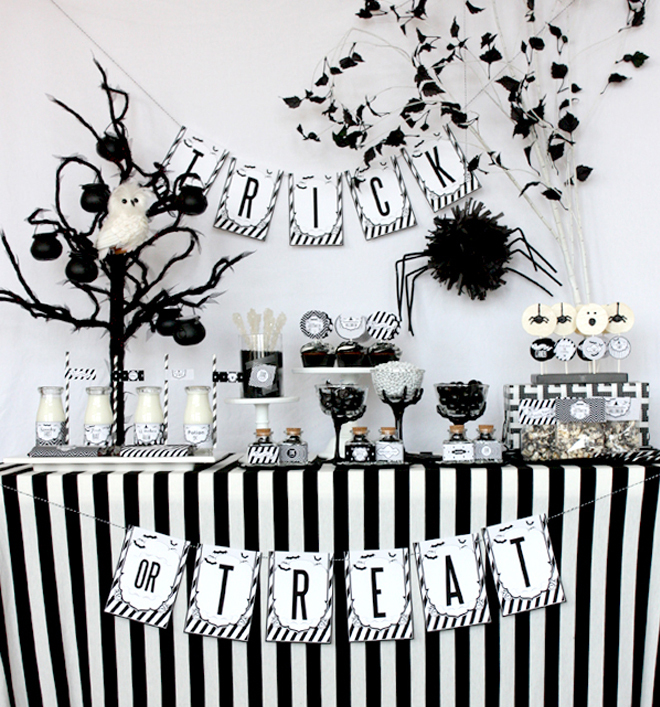 A treat table on Halloween party could be black and white too. 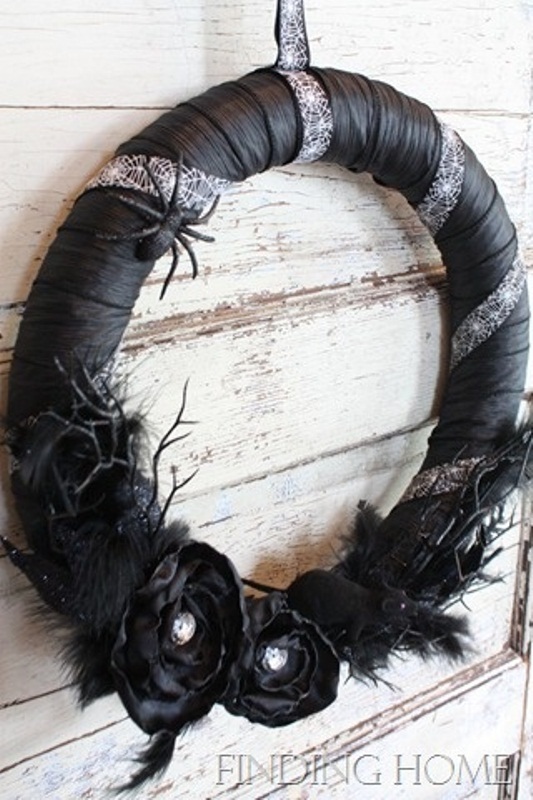 Can't wait for Christmas? 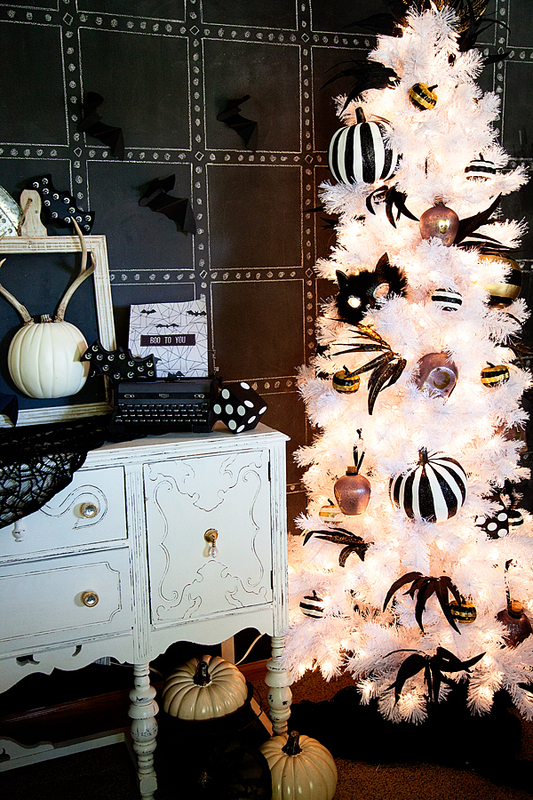 If so then dress a beautiful Halloween tree to make your interior even more sophisticated. 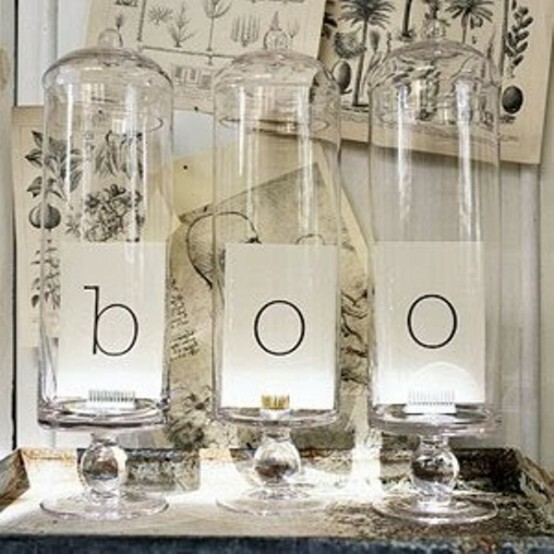 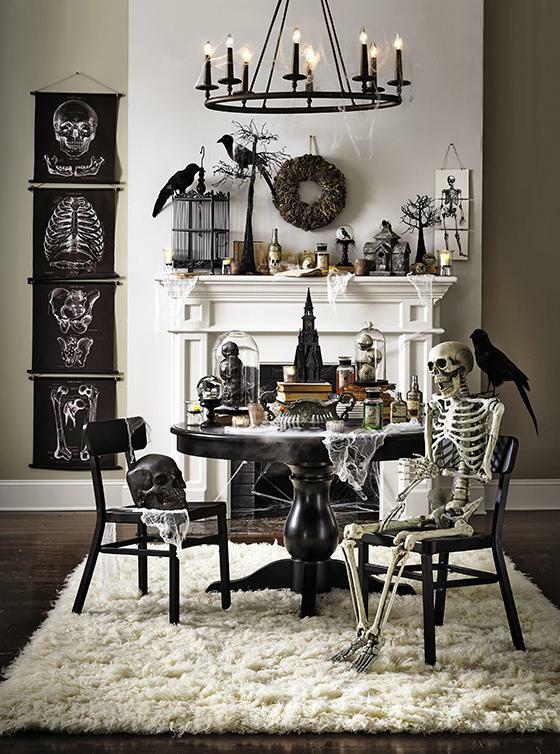 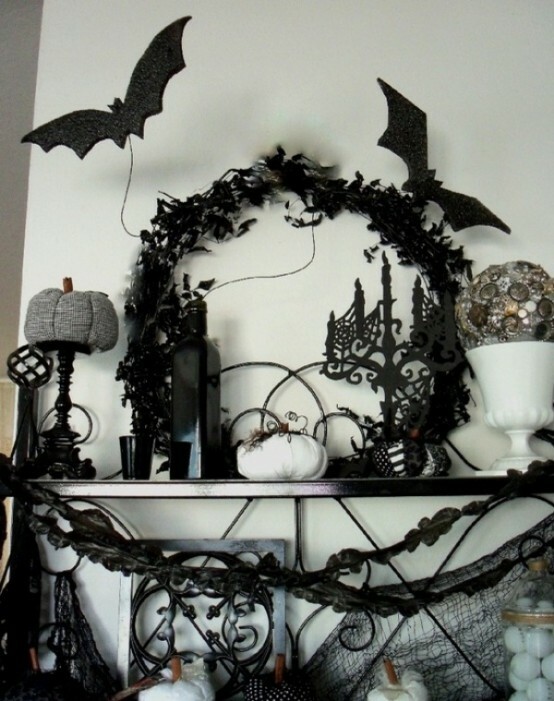 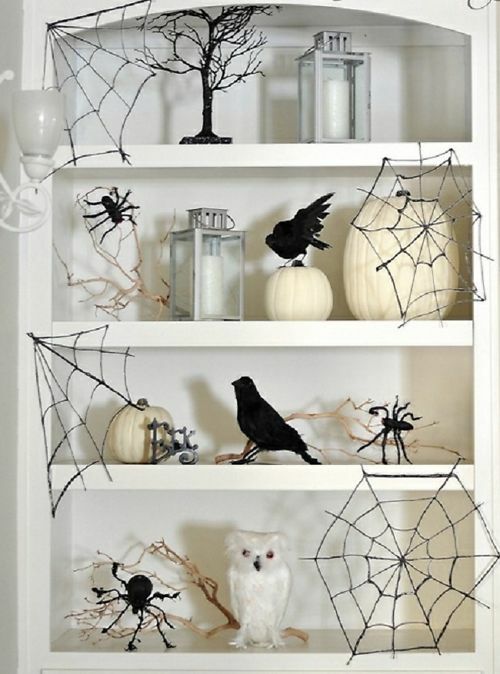 Any sideboard would be a perfect place for a retro Halloween display. 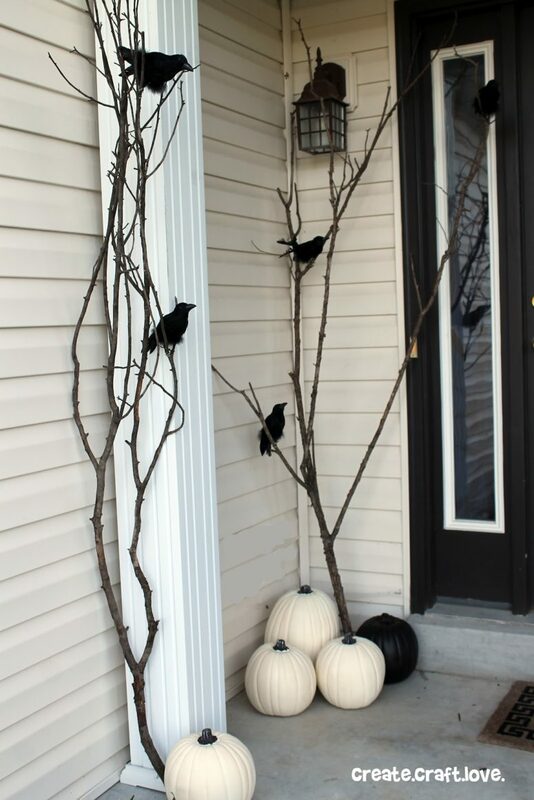 If your porch is painted in white then black ravens, tree branches painted in black and b&w pumpkins would looks gorgeous on it. 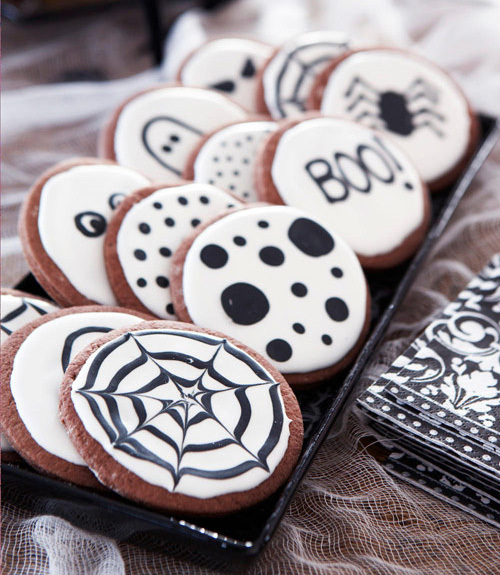 Handmade sweets are always great. 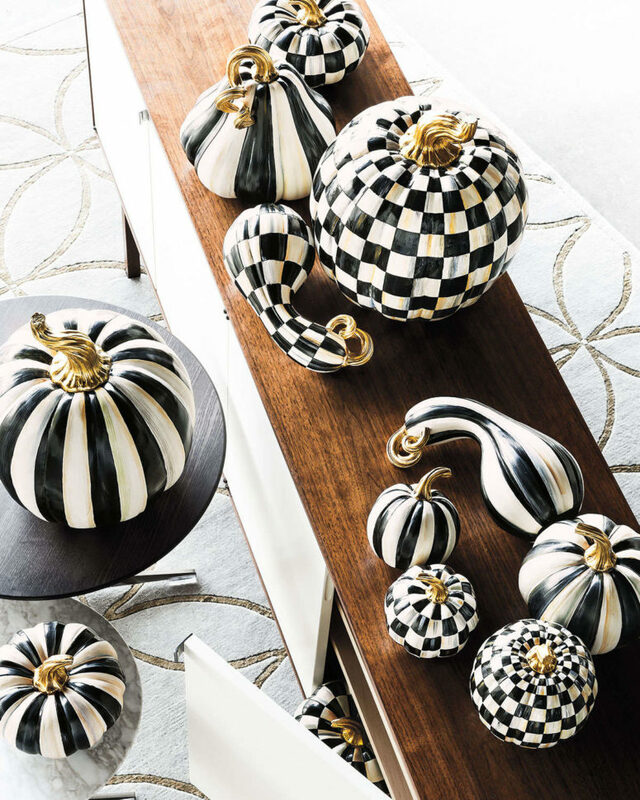 You can make them B&W too. 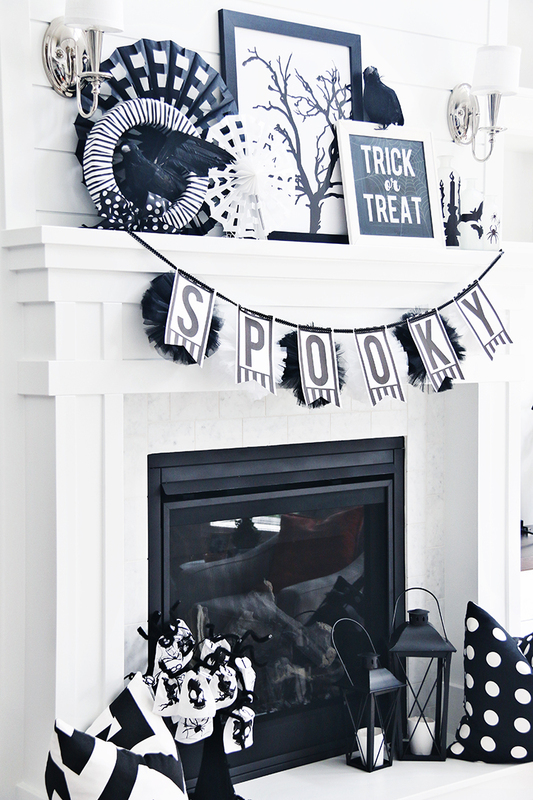 Black and white is a great color theme for a fireplace mantel decor. 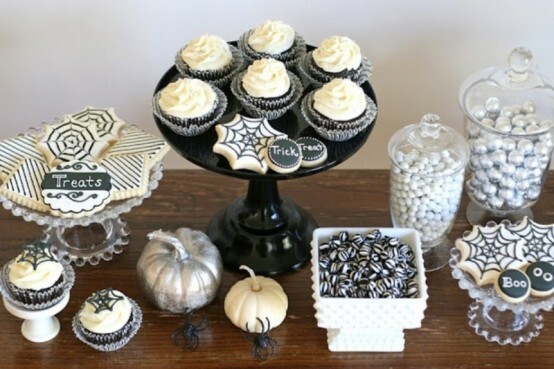 If you sweets table could be completely black and white. 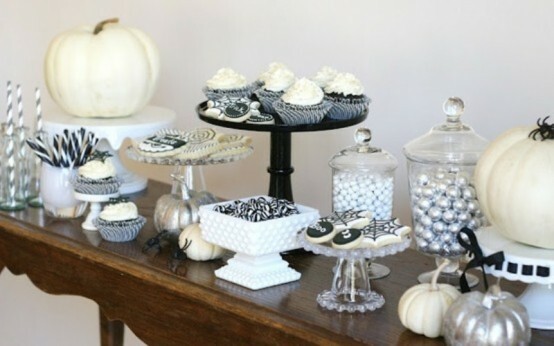 The addition of silver can always add a glam touch of elegance to the simple sweets. 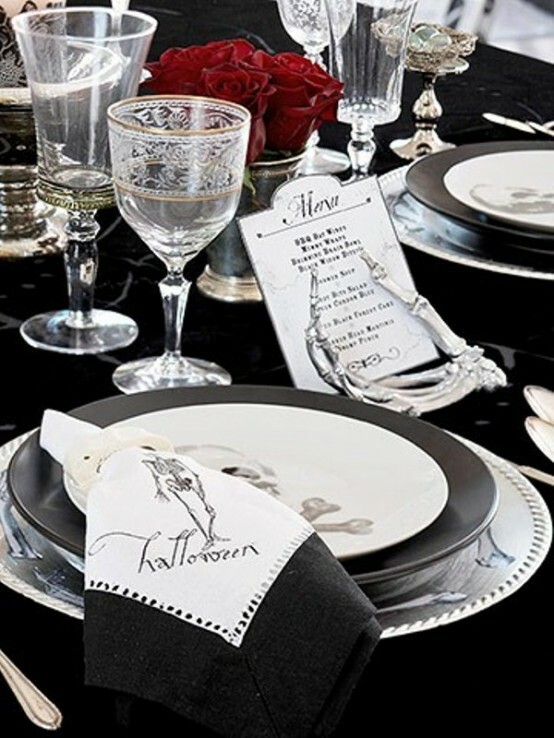 Black teams with white on this table setting to give it a touch of sophistication. 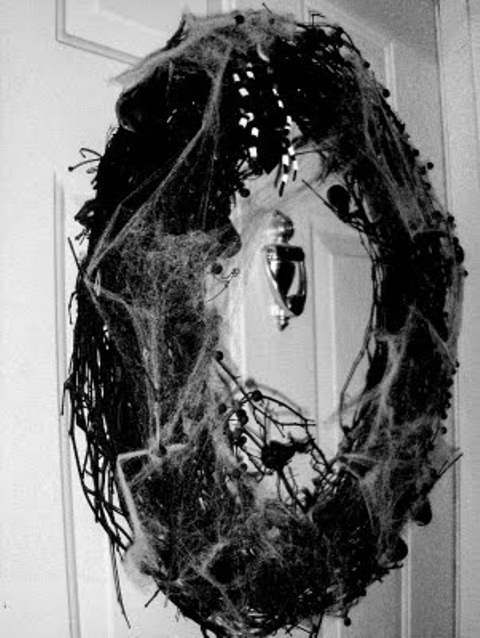 Decorating your front door with a wreath is the first thing you should think about before starting decorating your porch and yard. 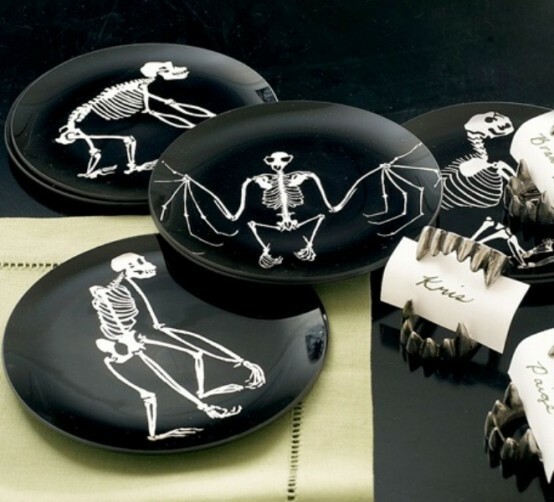 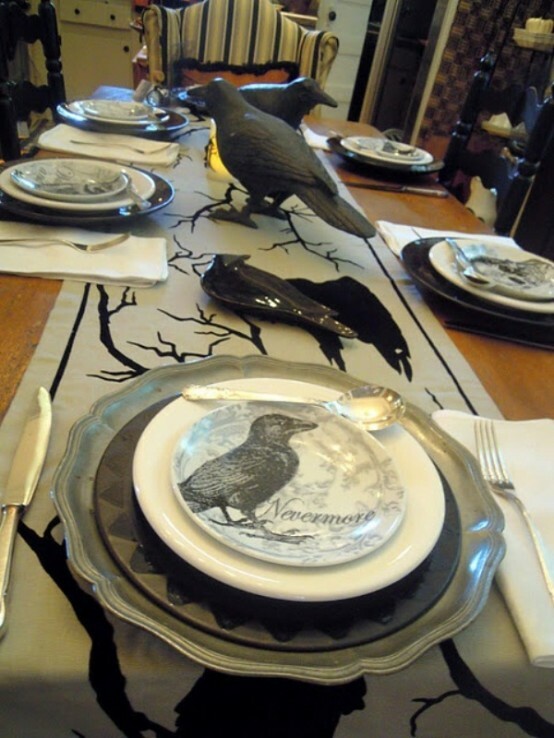 Bone-chilling napkins and plates are a must-have for your Halloween table. 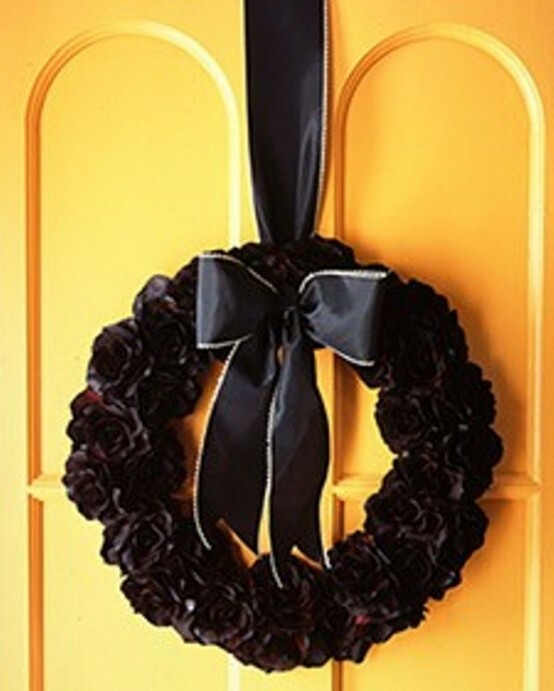 If your front door is bright and colorful then completely black wreath would look truly gorgeous on it. 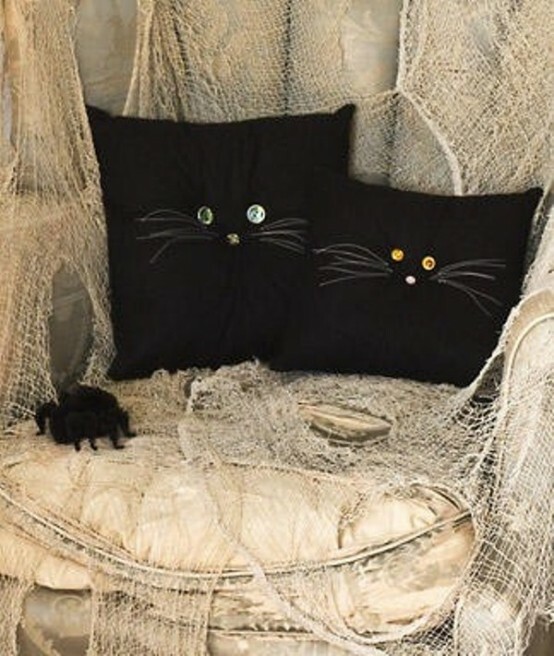 Turn your throw pillows into a cute, magical cats. 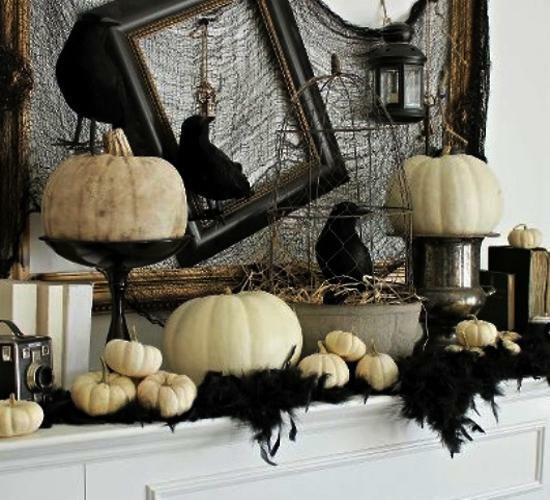 Ghostly white and glossy black pumpkins could frighten even the bravest of souls. 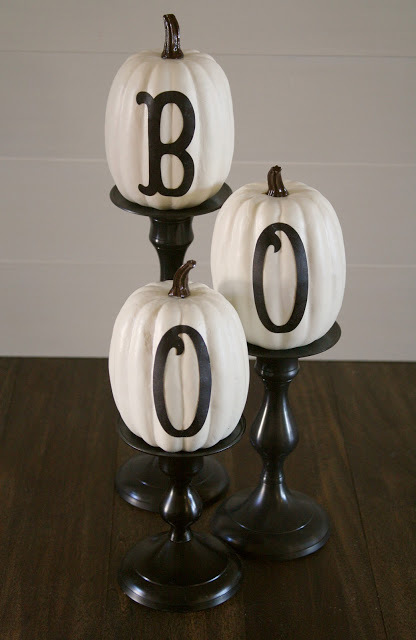 If you can't find white pumpkins, paint orange ones with several coats of white latex paint. 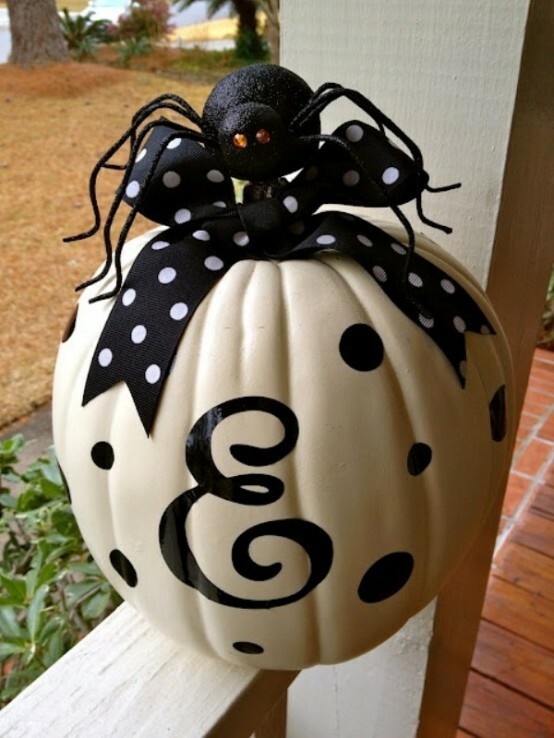 Next, using a paint pen you can freehand-paint or stencil simple black designs on them. 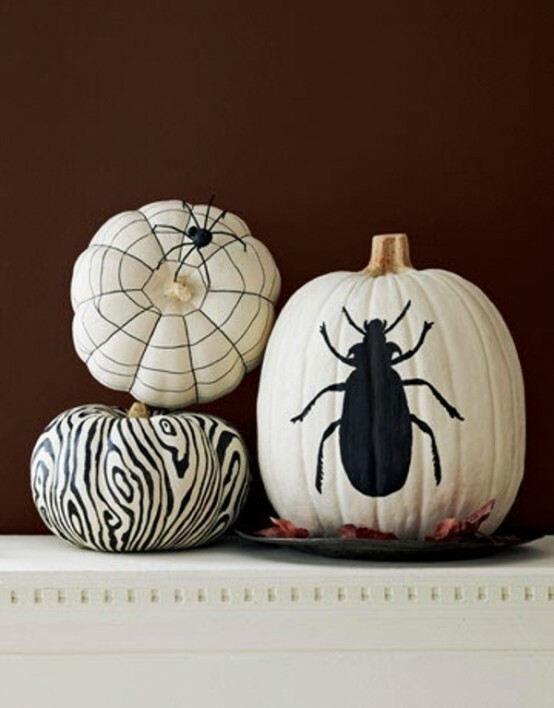 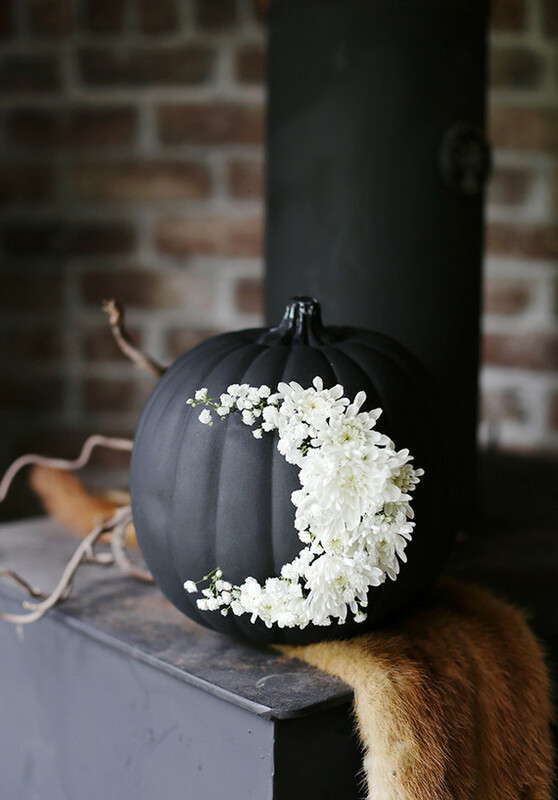 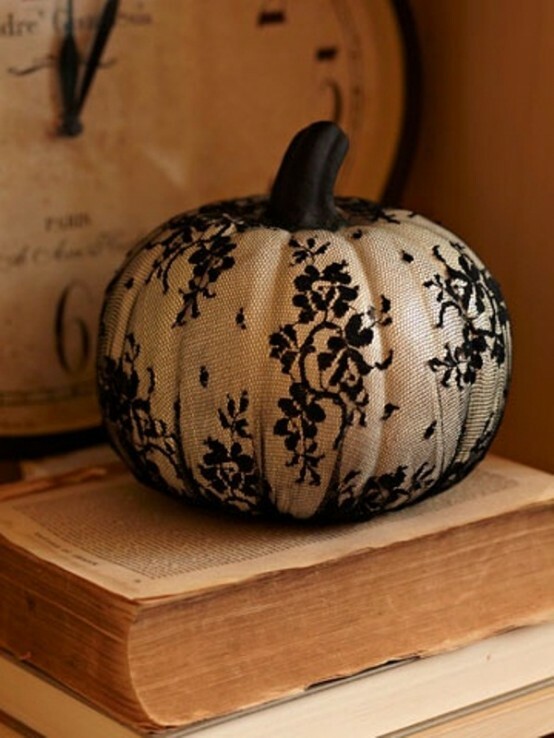 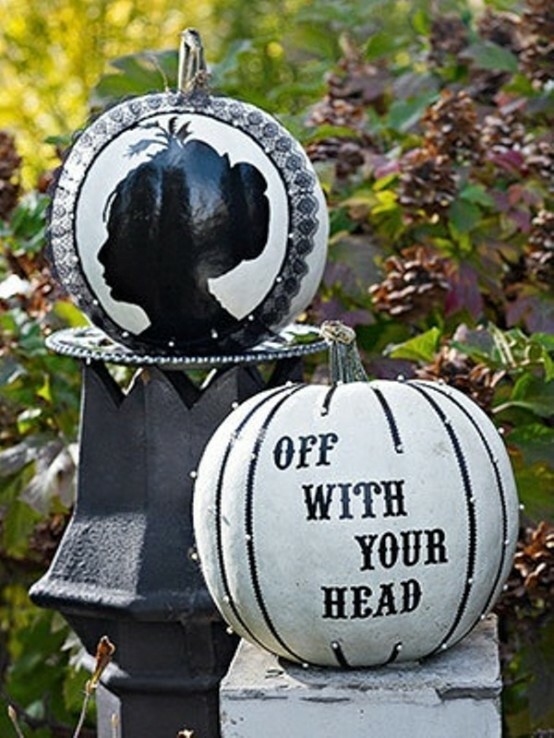 Black lace on a white pumpkin is one of those cool B&W Halloween ideas everybody could nail. 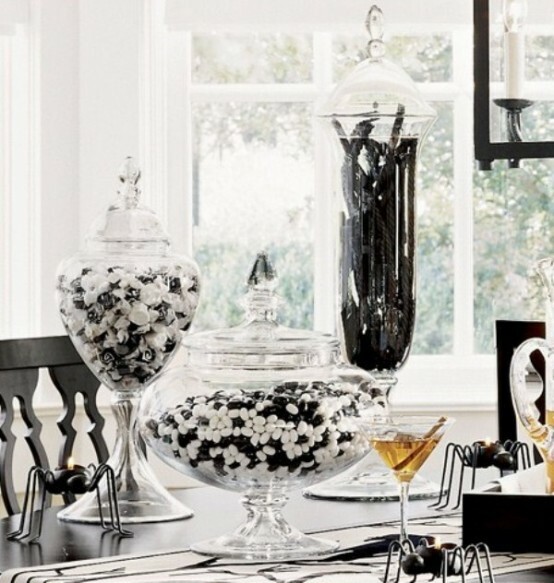 Gold and silver accents make B&W displays chic and glam. 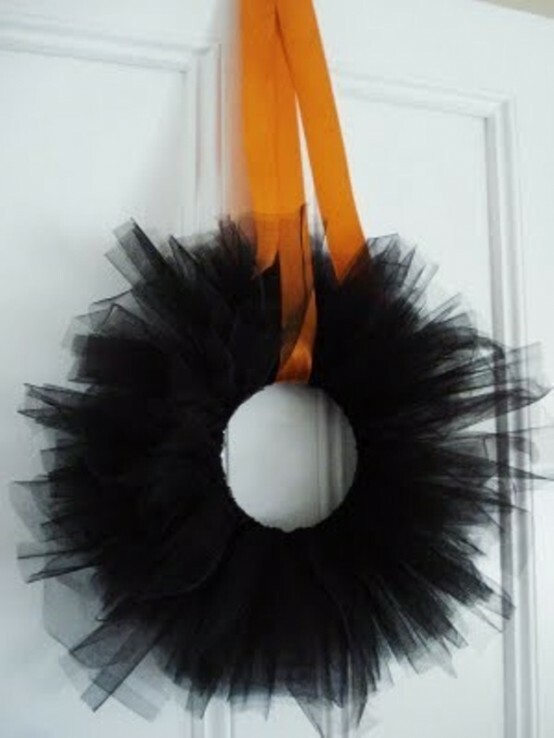 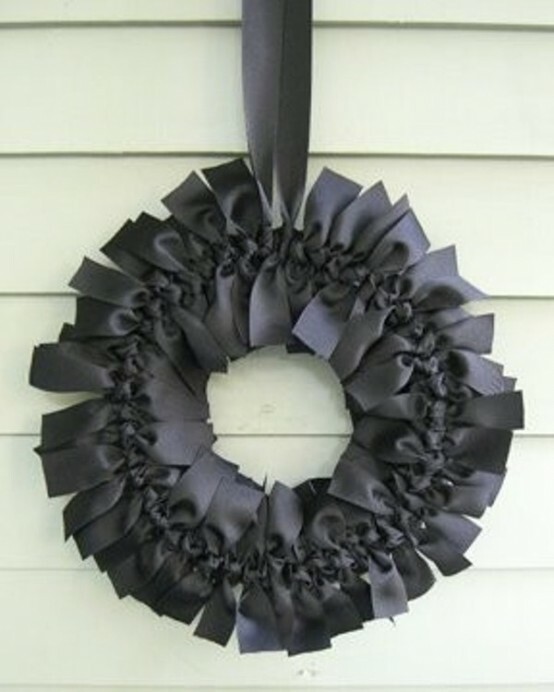 Simple black wreaths looks gorgeous on bright front doors too. 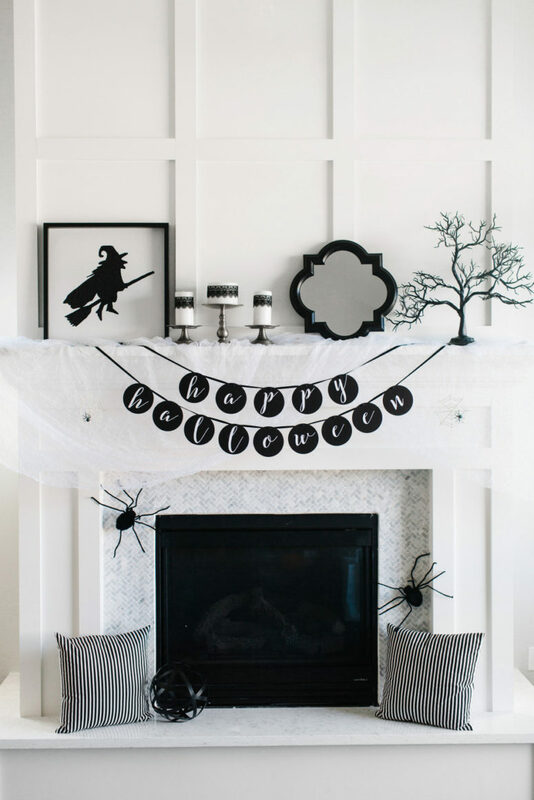 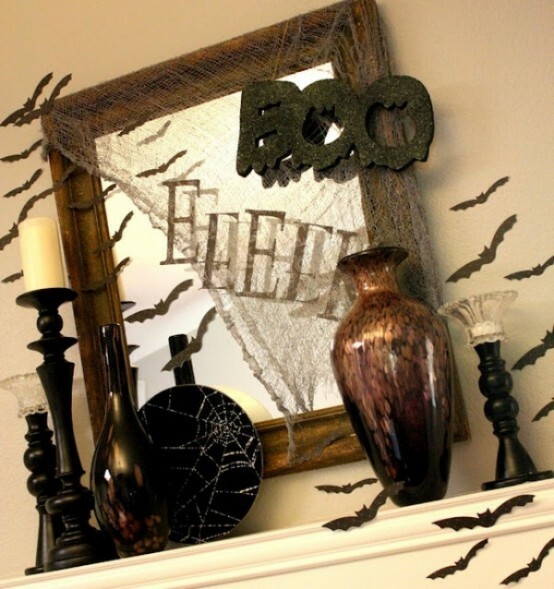 The fire place mantle is a great place to start your Halloween decorating. 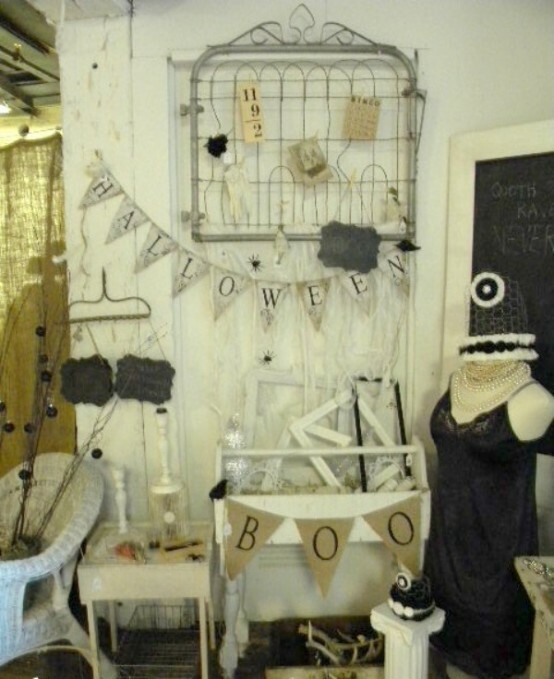 It’s a small space so you can get creative without spending too much money or time. 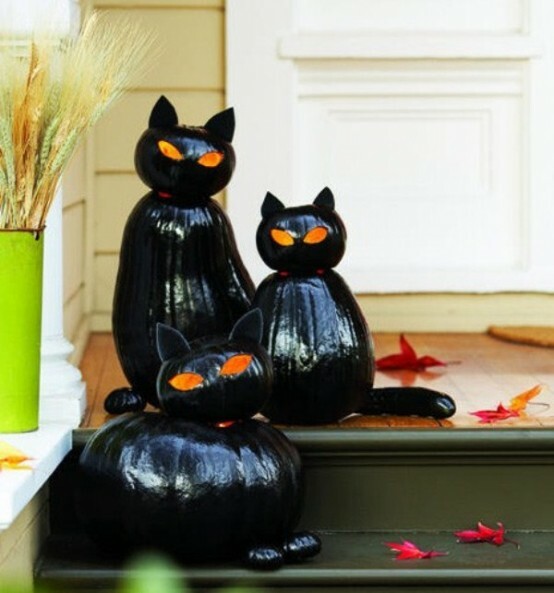 Guests and costumed kids will ascend the stairs with trepidation, unsure if they will get a trick or a treat if you decorate your porch with such creepy black cats. 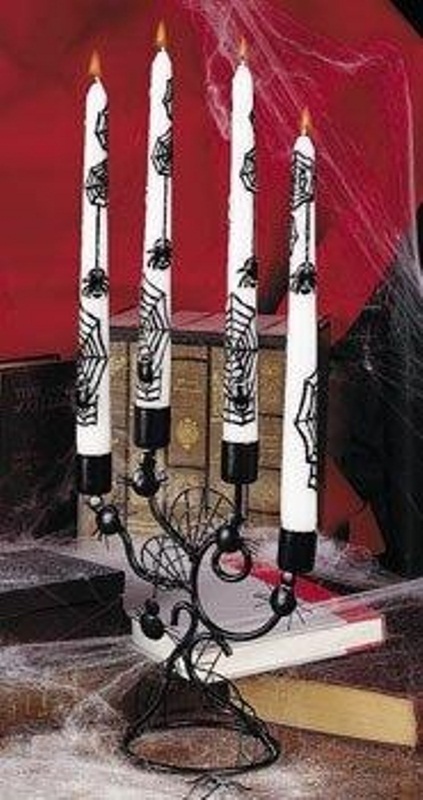 You can freehand-paint some creepy spiders even on simple white candles. 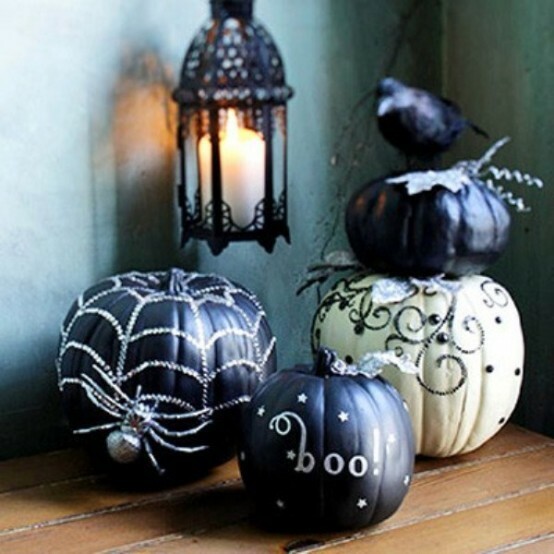 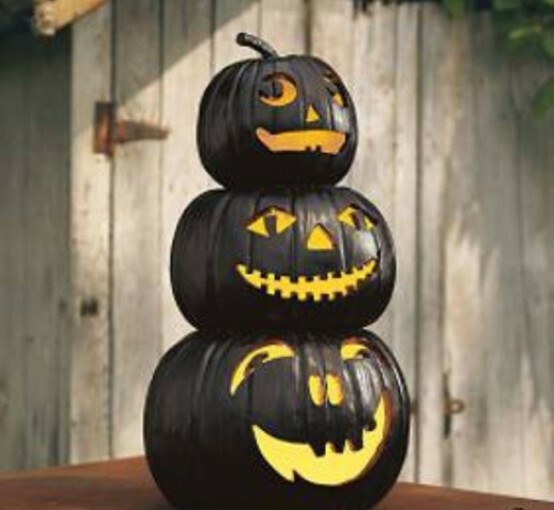 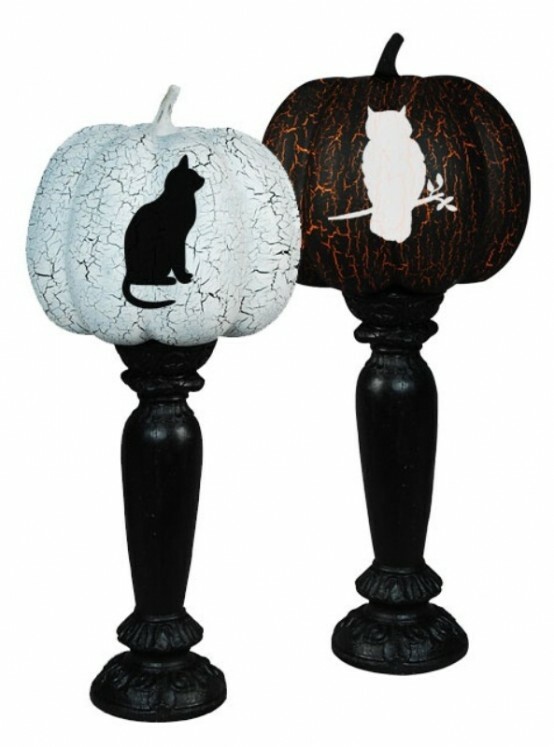 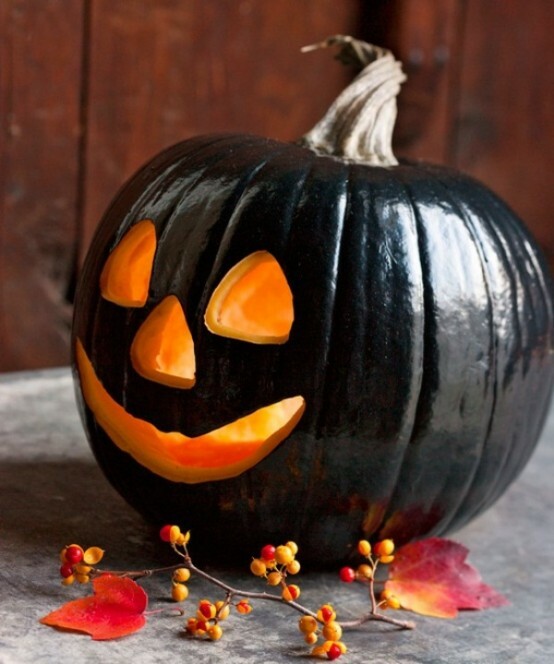 For a more original look paint your jack-o-lanterns in several coats of glossy black. 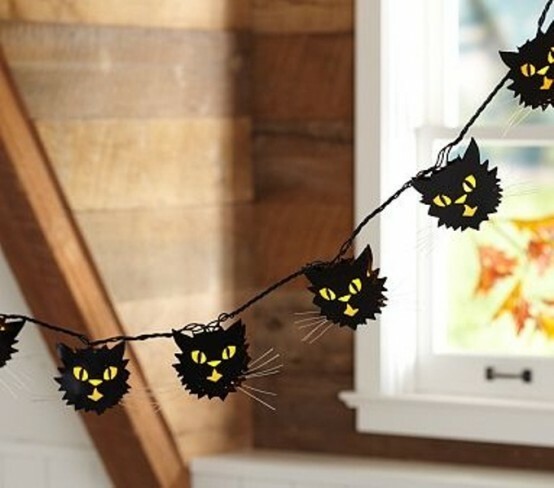 You'd be amazed how cool they'd look like. 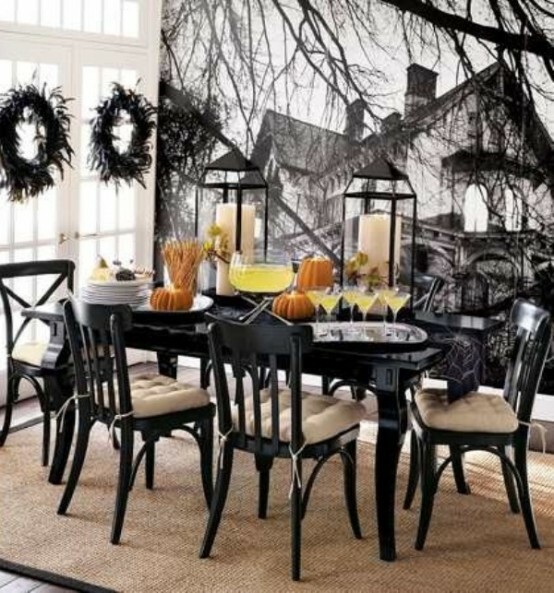 Turn your tablecloth in a spider's web. 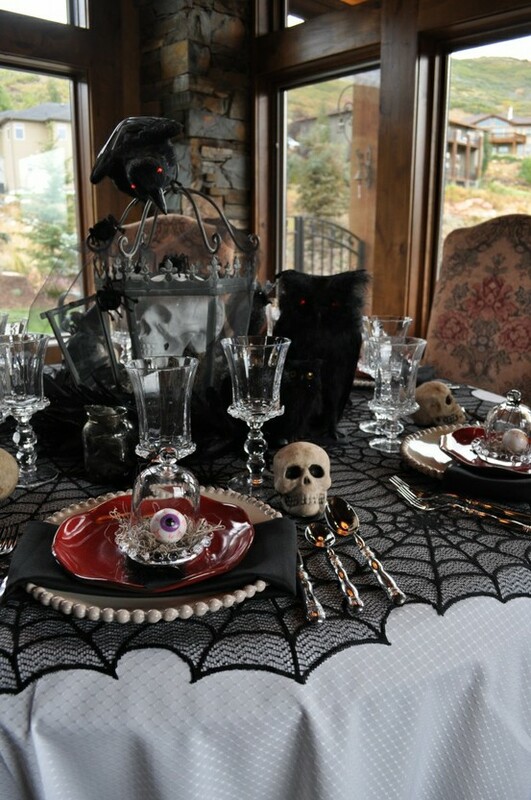 Any table setting would be much more creepy with it. 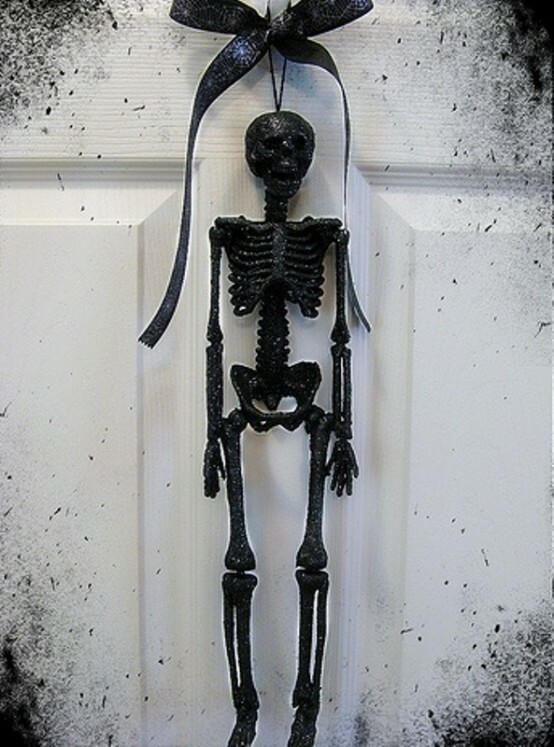 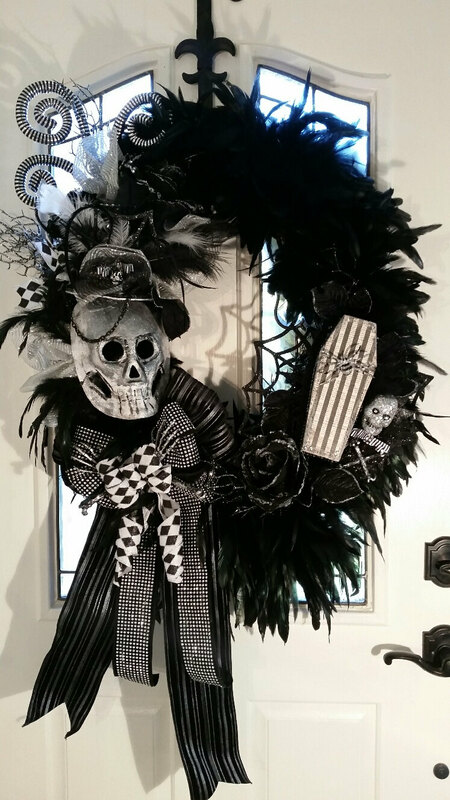 In case you aren't fond of round wreaths, you can hang a skeleton figure on yours. 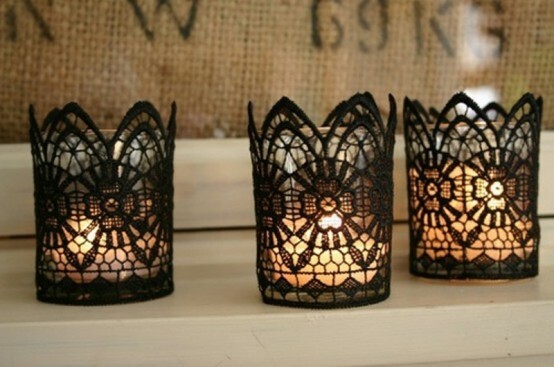 Put some black lace on your candle holders and light them up on Halloween. 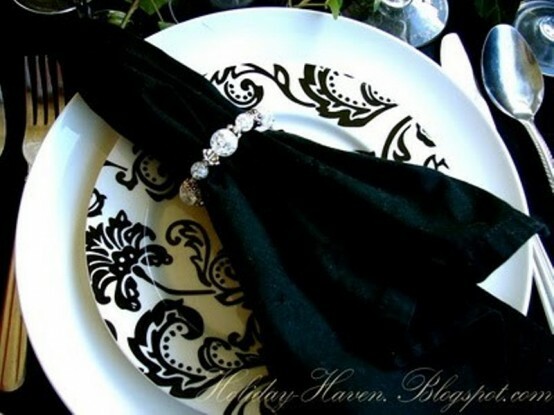 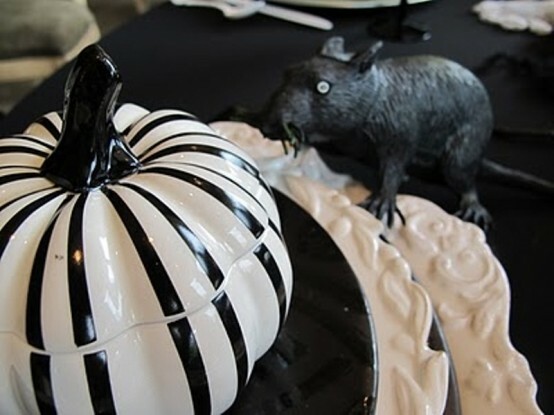 Black and white tableware always looks sophisticated especially in a dark Halloween table setting.